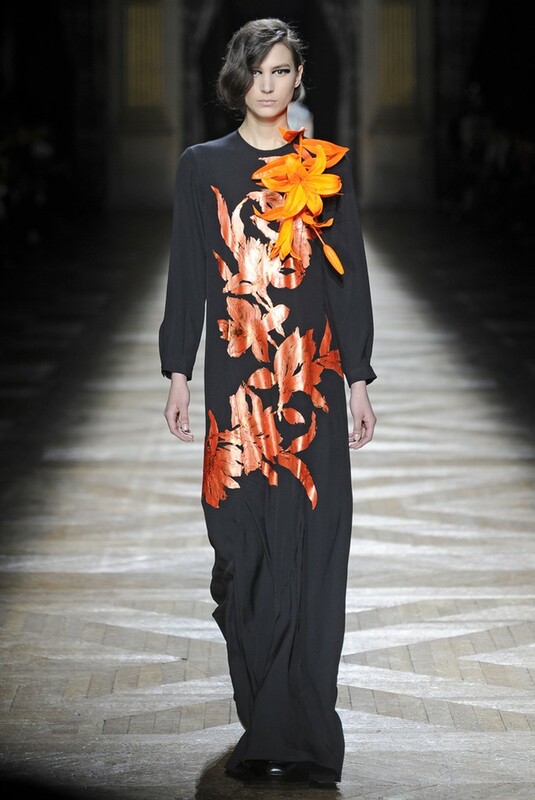 Dries Van Noten and Gareth Pugh RTW Autumn 2014 Paris – I’m in heaven! 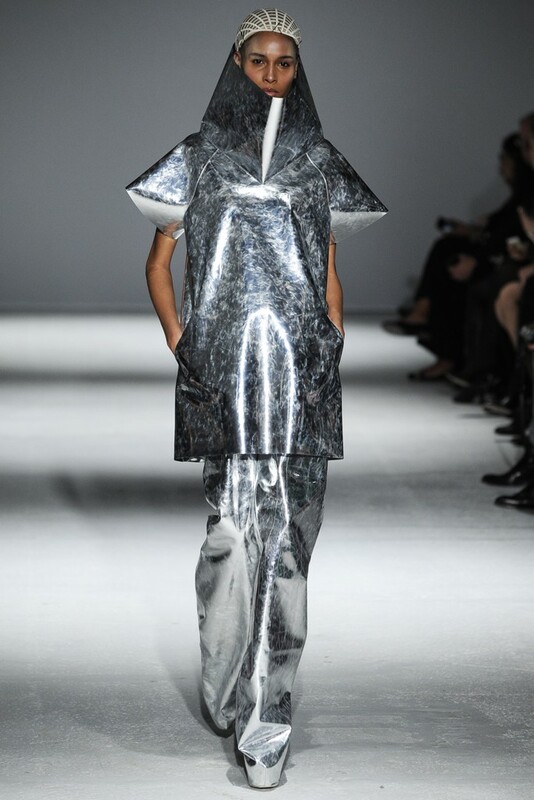 Today was the day for 2 of my favourite designers to showcase their new autumn 2014 collections on the catwalk in Paris and I was not disappointed. As you know if you are regular on this site I love design that steps away from the expected and the ordinary and love innovation, trend setting, fresh designers who really know how to push the boundaries and stay true to their vision on how they want to present and show their labels off and both of the designers today do just that. 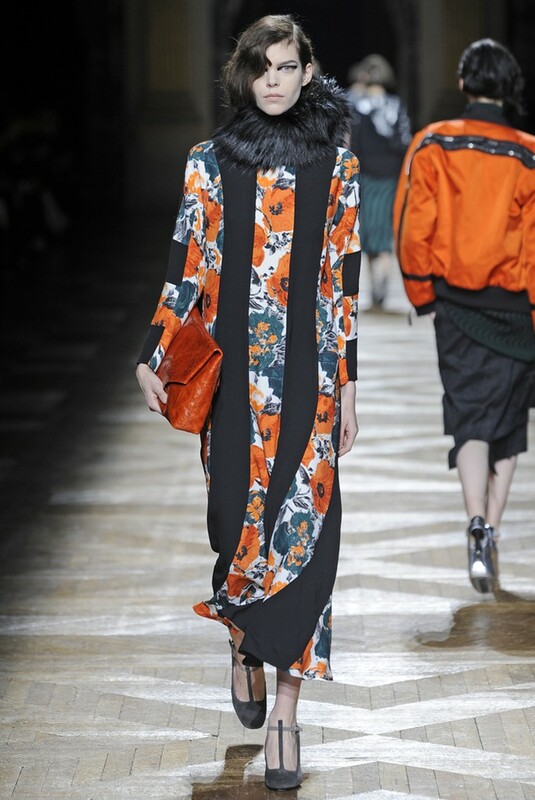 Dries Van Noten www.driesvannoten.be presented an autumn collection that was bold, audacious and practical in equal measure, making for powerful, trend setting fashion. 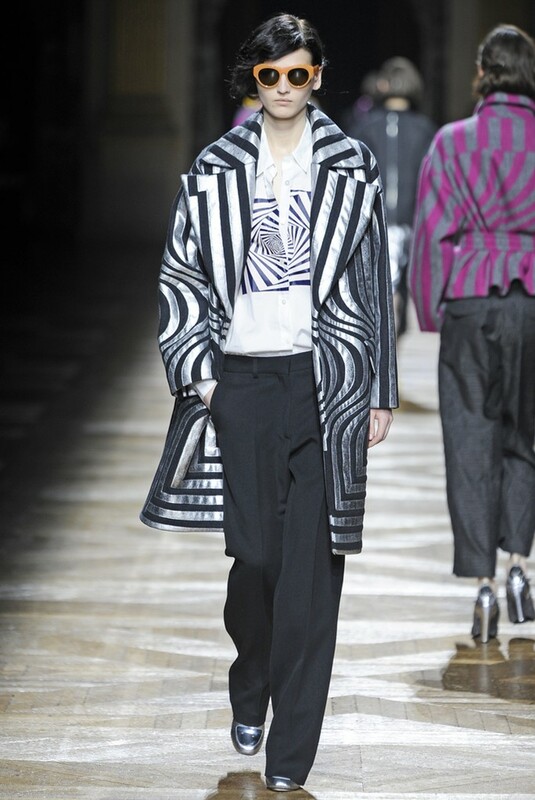 Sporting strong graphics and a potent, colour intensity layered onto Van Noten’s clothes with their unmistakable masculine edge all added up to another first class showing. 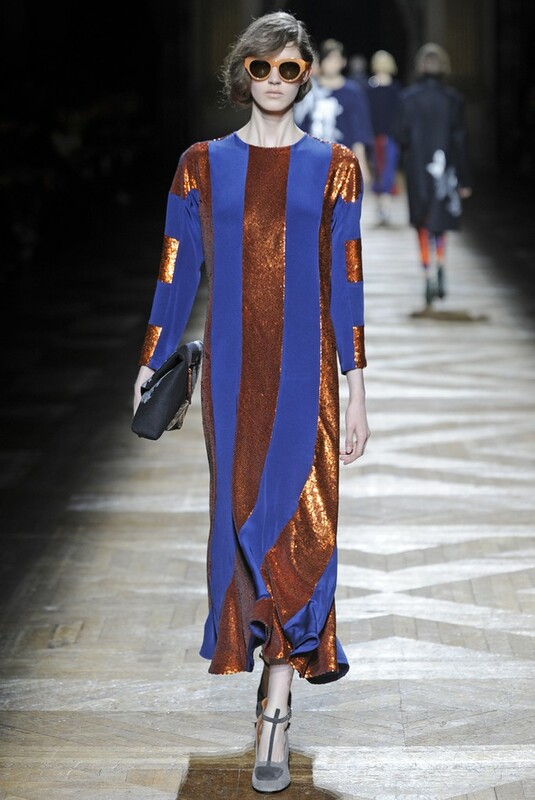 This was the collection that Van Noten wanted to do colour and fun and from that came the name for the collection “Coutorama”. 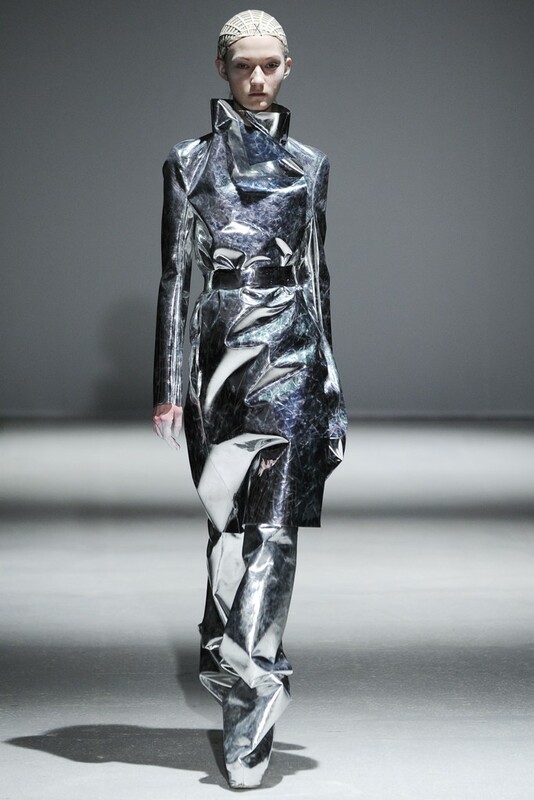 It was all about strong lines, graphics and acid colours that had added hand-painted flowers in silver that found themselves positioned throughout the collection in a random way that made it all the more real. 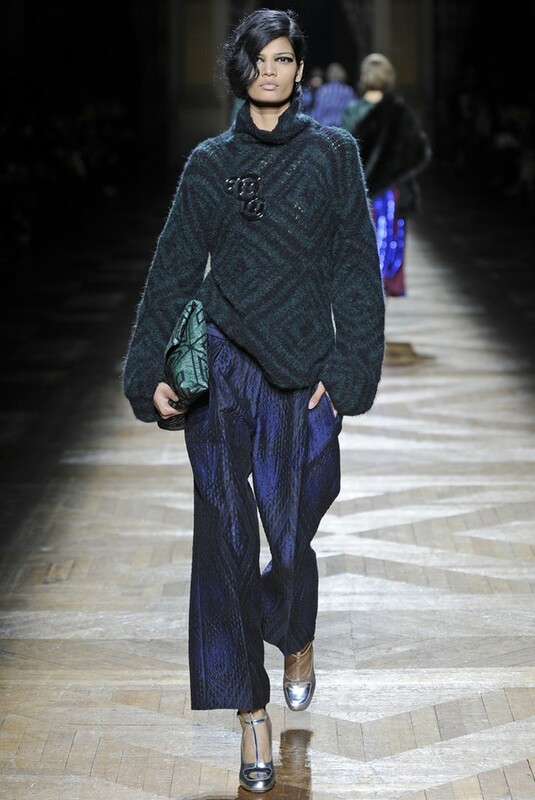 Having been a follower of Van Noten for a several years now I know that one of his strengths is his ability to control the motifs he uses and they are not really random at all but very intentionally placed. 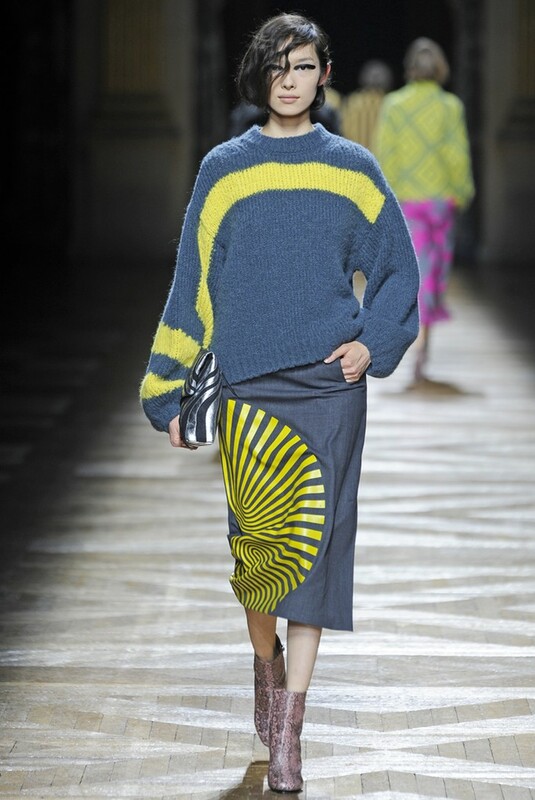 This collection included swirls, overlapping circles and broken-striped grids that were expertly placed. There were times when he went for a contrasting look: an emblem of green and gray circles fused to a rather plain, mannish coat. 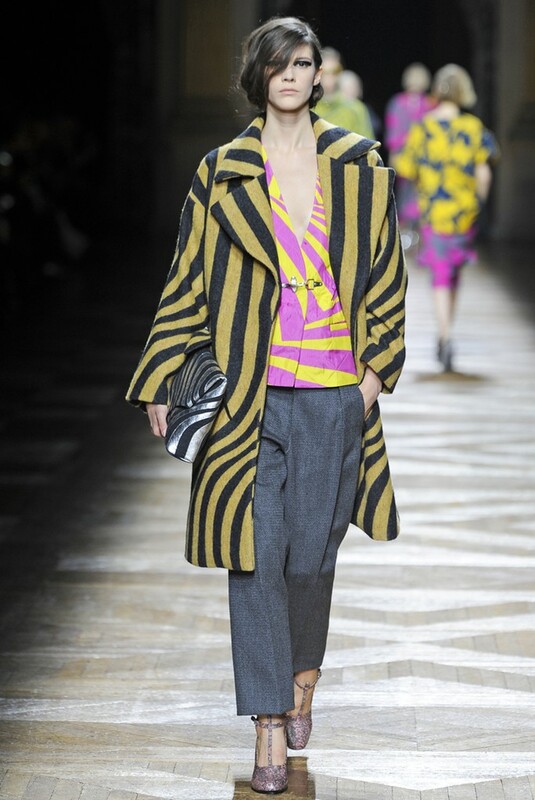 But really stood out was the full-on shock of colours fused and meshed together: a panel of circles in canary yellow and grey on a belted jacket in purple-and-grey swerved stripes. 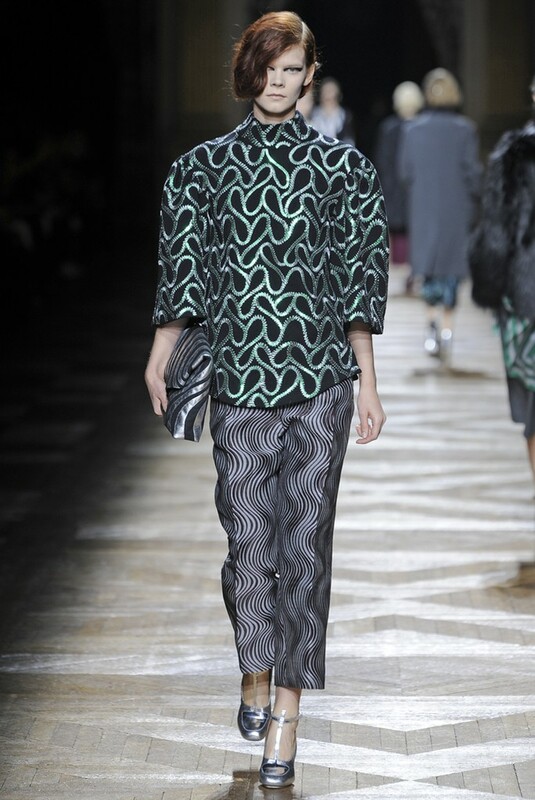 Then there was the same graphics on floral-print separates, the base pattern large and vibrant. 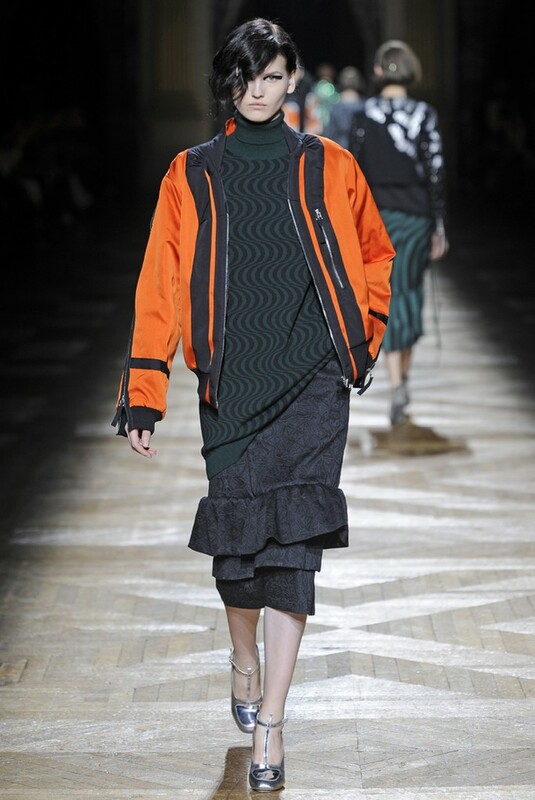 This was not all form and structure though with Van Noten integrating some athletic references with jackets and pants with zippers and parachute details that stood in contrast to the collection’s more obviously tailored edge. 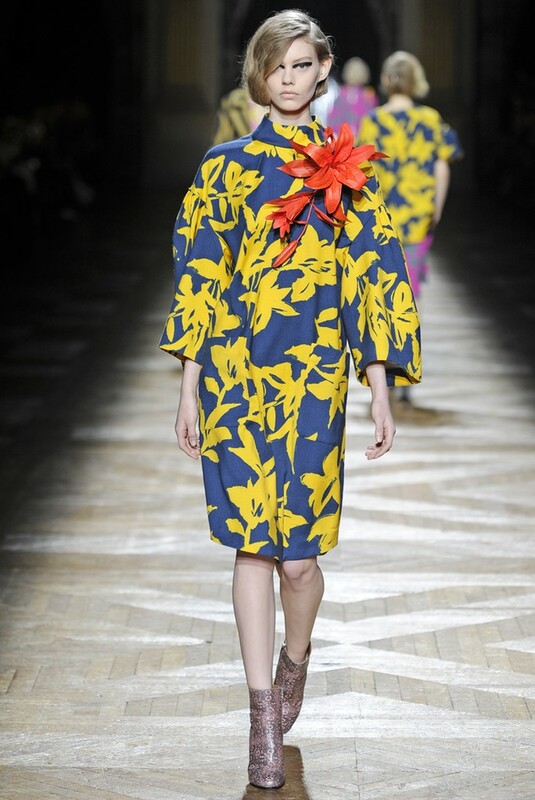 This was all about ample proportions, right down to the primary accessories – large 3-D flowers perched on the shoulder that were a stand out and did not fall into the background at all. It all added together to give a polished showcase of a fabulous collection. 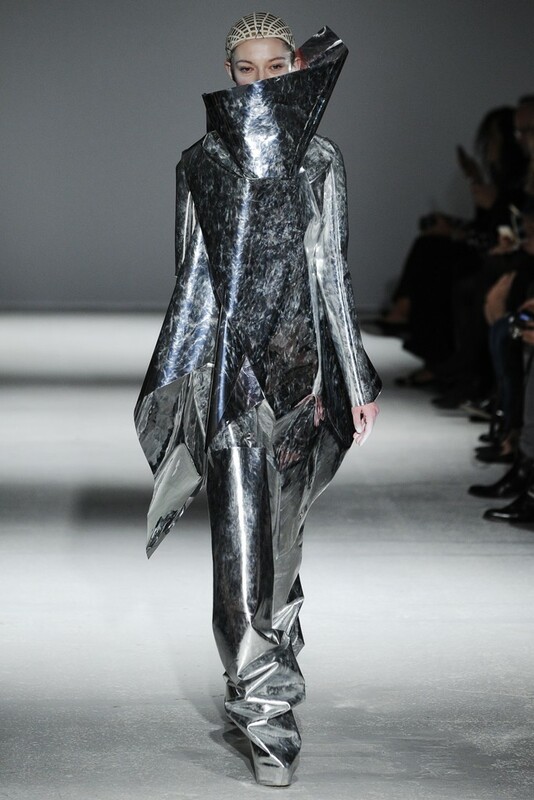 Gareth Pugh www.fuckyeahgarethpugh.tumblr.com has always been a designer that marches to his own Gothic romance drum but he has had a few moments in the last few seasons when he was going to become more commercial. 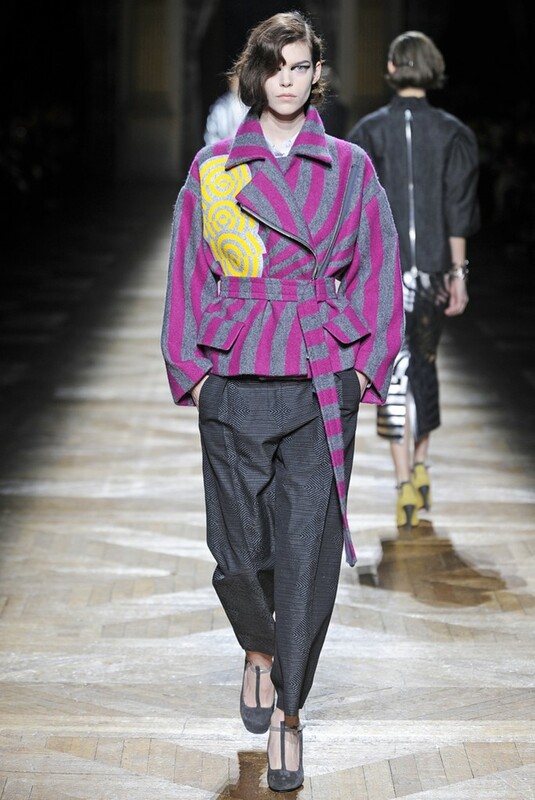 His Autumn collection was certainly not one of those moments although there were certainly some coats, pants and skirts that have a distinct commercial appeal but overall this as about theatrics and strange melding together! 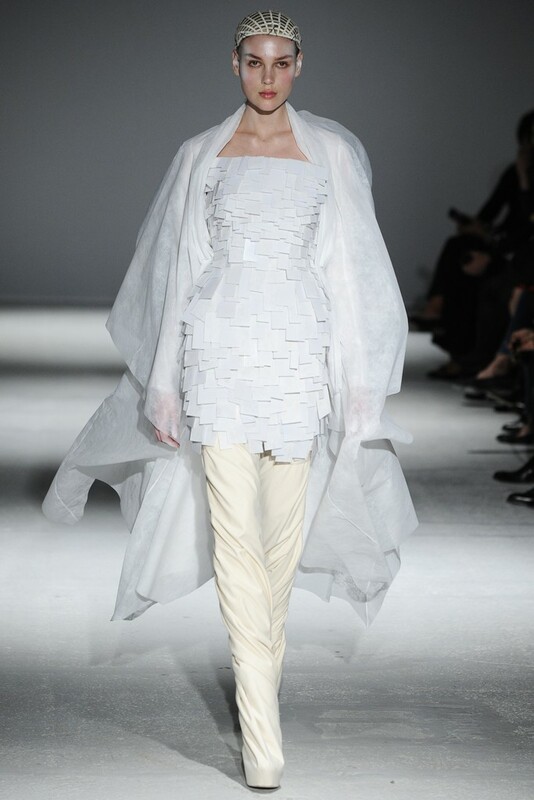 This was a collection of experimentation and without a dense or evolving colour palette but played with silhouettes and offered some new takes on grand collars and necklines that engulfed the model to great effect. 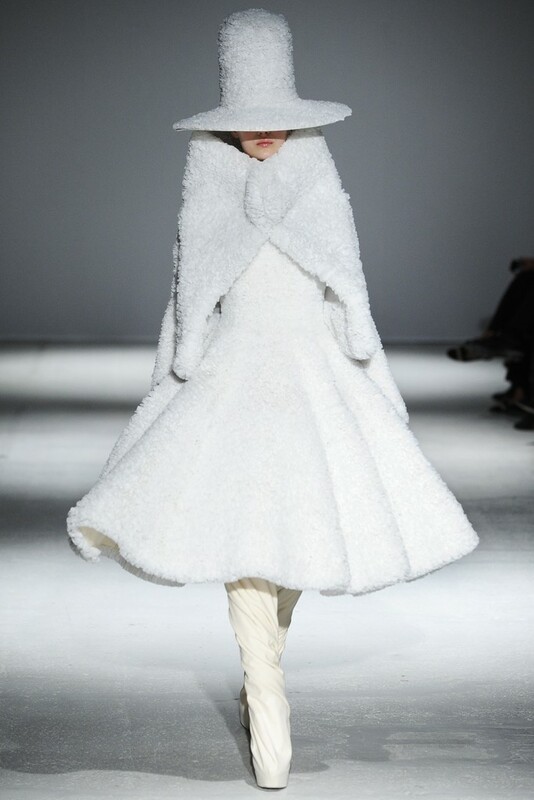 The collection was presented in either white, ivory or mirrored silver and created a snowy winter feel that was uplifting and bright. This was a collection that will get lots of editorial attention because it will shoot amazingly and look stunning in any upcoming fashion shoot. 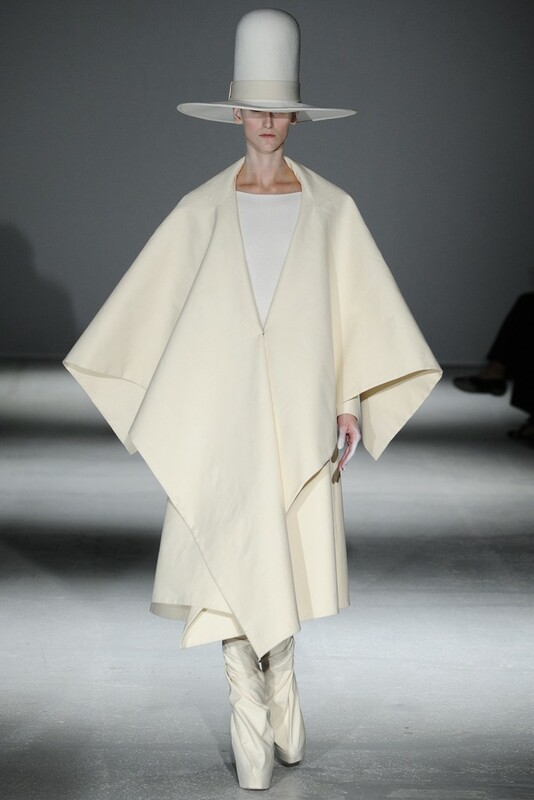 There was a dress with a full skirt of folded pleats with a matching funnel-neck cape and an oh so tall 10-gallon hat, all done in white. 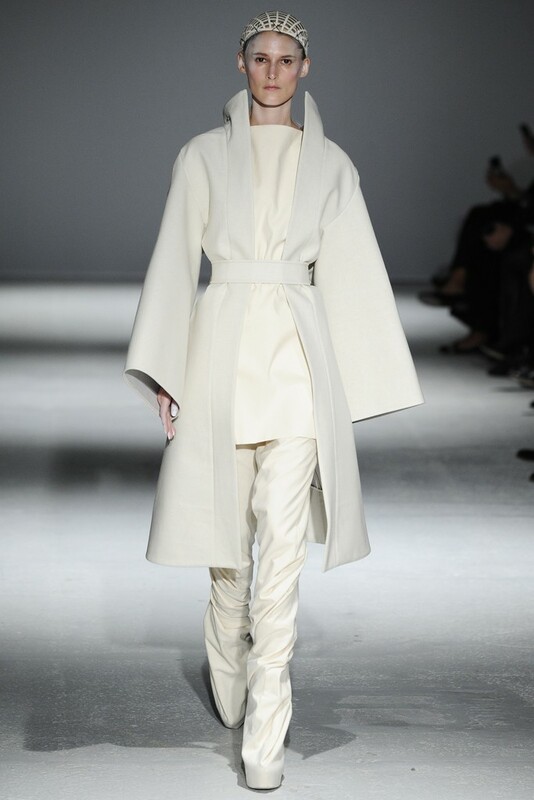 There were cloud like billowing white robes, rich dresses done in furs, and an oversize tunic with a huge funnel neck worn over matching baggy thigh-high boots in a mirrored silver treatment. 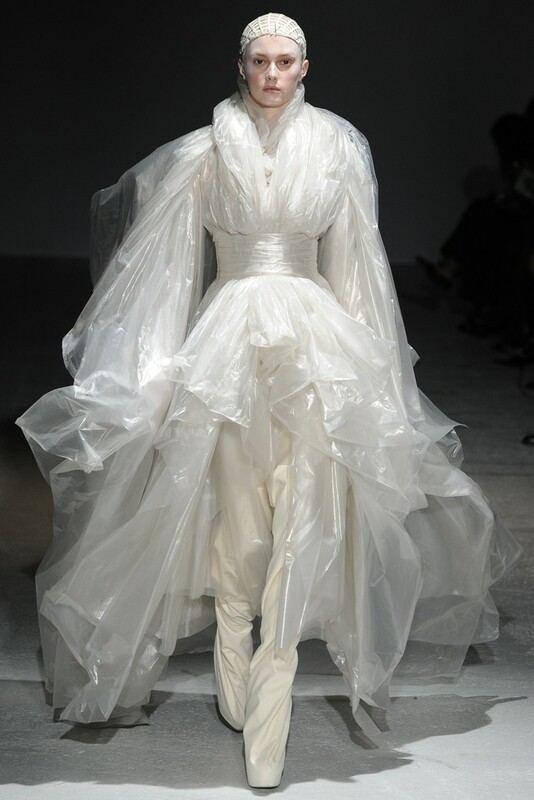 Some of the looks appeared to look like they had evolved from the collection of plastics and plastic bags and created a feel of a collection of recycled fabrics. 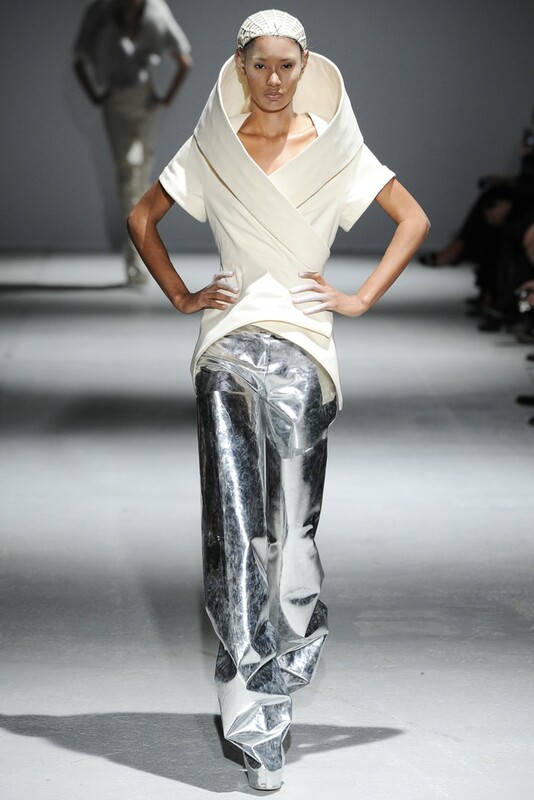 I could also see any one of these looks being used in a new Fifth Element movie – futuristic and stunning! 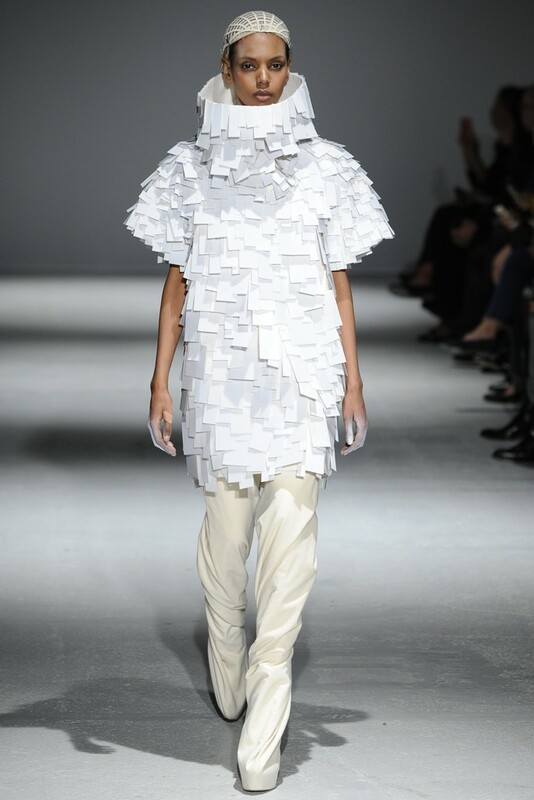 Never one to disappoint and always putting on a show Gareth Pugh once more cemented his role as a leader in new, compelling fashion that makes you sit up and take notice! 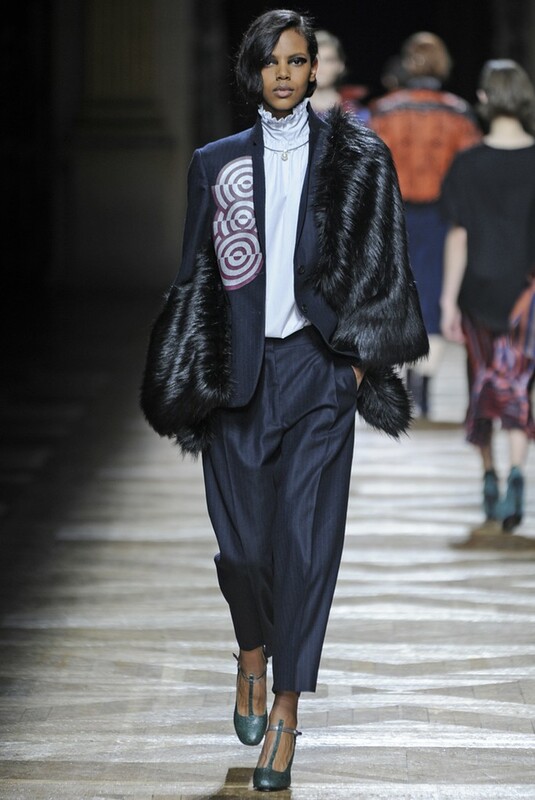 From Milan to Paris for RTW Autumn 2014 – the roadshow continues! 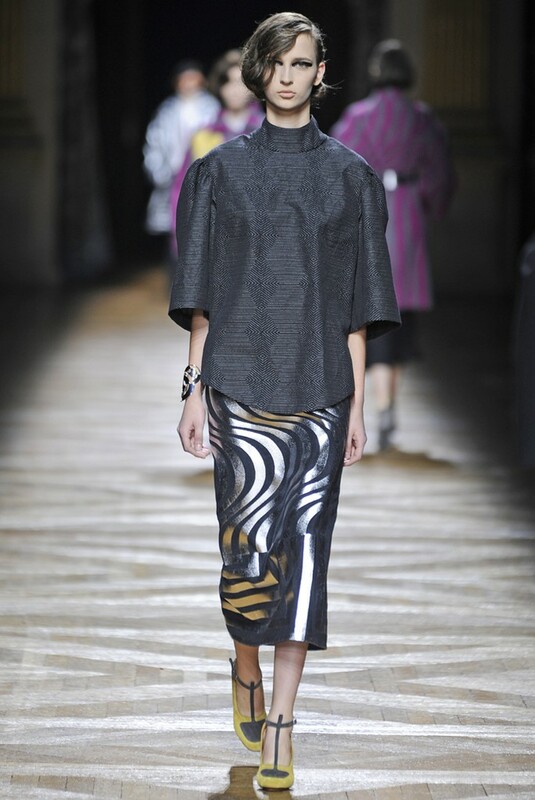 Lanvin and Rick Owens each bring something wonderful to Paris RTW Autumn 2014! 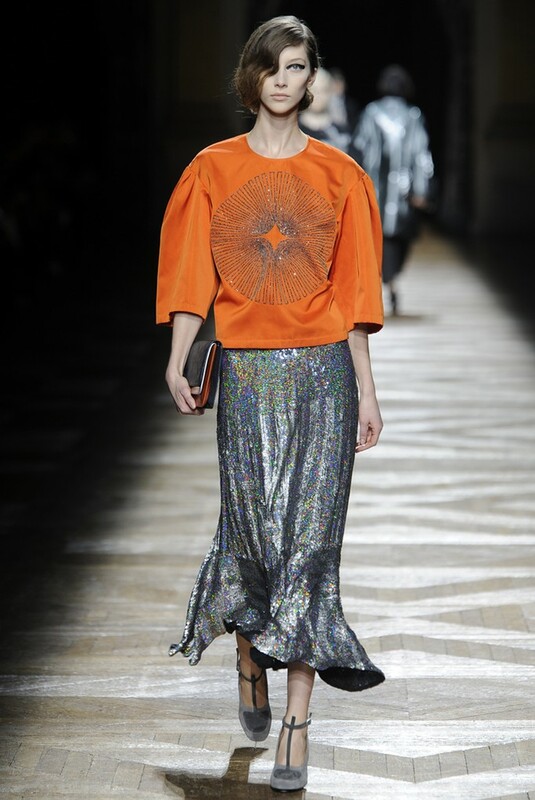 I love funky styles like these. Yeah they are so great!